David Roddy wasn’t the first Class of 2019 prospect in Minnesota to receive a basketball scholarship offer from the home state program. In fact, the 6-foot-5, 250-pound Breck School power forward didn’t pick up serious major conference interest until this summer, but Roddy now has three Big Ten offers, including the Gophers. Roddy is the first in-state 2019 target to schedule an official visit with Minnesota. He plans to visit the U from Sept. 14-16, while also setting up officials with Colorado State on Sept. 8 and Northwestern on Oct. 13. Roddy’s Howard Pulley AAU program failed to reach the Nike Peach Jam this year, but he averaged 15 points and seven rebounds in EYBL league play. Definitely the type of numbers to make coaches like Minnesota's Richard Pitino and Northwestern's Chris Collins to take notice. He's undersized for a post player, but his massive frame and explosive leaping ability might remind NBA fans of Charles Barkley-type player. Roddy's been perfectly comfortable carrying around 260 pounds during most of his high school career since he also plays football. Roddy has heard the Gophers compare him to their All-Big Ten senior forward Jordan Murphy, who is a dunking and rebounding machine at 6-7 and 250 pounds. 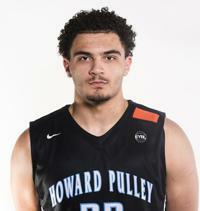 Current Gopher freshmen Jarvis Omersa, Daniel Oturu and Gabe Kalscheur played with Roddy on Howard Pulley's team last summer. They were excited about the possibility of being reunited in college when Minnesota offered Roddy in early August. Minnesota lost touch with Roddy for months after his main recruiter and former U assistant Ben Johnson left to join Xavier’s staff in the spring. During that time, Northwestern coach Chris Collins made Roddy a priority and got to know him during an unofficial visit to Evanston in June. The Wildcats were the first Power Five school to offer him in July. One of the state's top multi-sport athletes, Roddy averaged 25 points and 13 rebounds on the hardwood. He threw for 2,079 yards with 24 touchdowns and 12 interceptions on the gridiron at Breck in 2017. He has offers from Wyoming and Football Championship Series programs such as North Dakota State, South Dakota and Northern Iowa to play quarterback. Roddy doesn’t have more Power Five football offers because he isn’t interested in being moved to another position. Roddy doesn’t want to be a two-sport athlete beyond high school, but he's humbled now to be able to decide whether to play basketball in the Big Ten or play football as a quarterback at a smaller school.